Construction of Kenembo Community Health Post in Dei District of Western Highlands is progressing well and should be completed within the next few months. Member for Dei and Minister for Transport, Mr Wesley Nukundi is funding this project under his District Services Improvement Program (DSIP) at a total cost of over K2.2 million. Chief Executive Officer of Dei District, Batamai Tipi said the facility should have been completed some time ago but due to lack of funds, the job had been prolonged. He said financial constraints faced by the country had played a major part in the delay as the DSIP funds had not been released on time. Mr Tipi said the district had made available K1 million for construction work to begin and together with a contribution of K500,000 by the Western Highlands Provincial Health Authority (WHPHA), work had commenced and progressed quite smoothly. He said the contribution by the WHPHA was refundable and early this week, he presented a cheque of K358,898 to the Authority. He thanked the Authority for the contribution which helped to speed up work on the project and added that the balance would be paid up as soon as the next lot of DSIP funds were disbursed by the Government. The WHPHA’s team leader for PARSU (Payment, Accounting, Reporting and Support Unit), Richard Wak when receiving the cheque on behalf of the Authority thanked the Minister and Mr Tipi for refunding the money at a time when the Authority needed it most to buy urgently needed drugs and medical consumables. 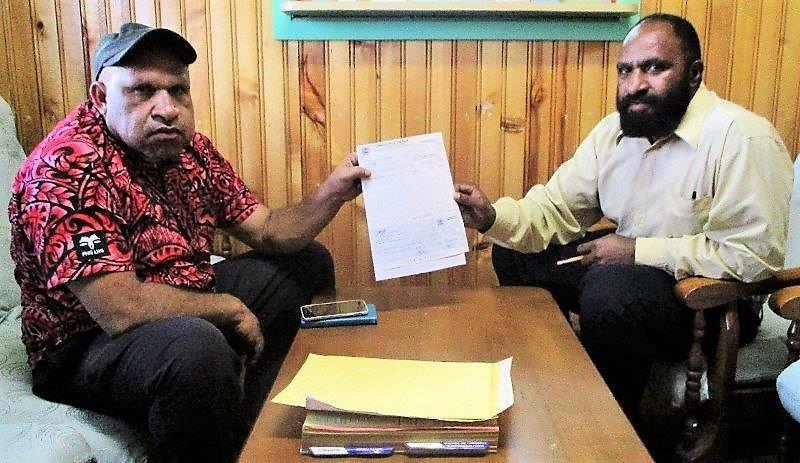 Chief Executive Officer of Dei District, Batamai Tipi (left) presenting the cheque to WHPHA’s team leader for PARSU, Richard Wak.